Voice Query: Is the bedroom light on? 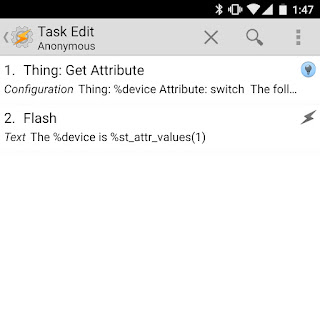 In this tutorial, we will briefly demonstrate how to use Tasker, AutoVoice, and SharpTools to query the status of devices in your home. At the end of the tutorial, you will be able to say Okay Google, is the bedroom light on? and your phone will check the status of the light and say the status as a voice response (eg. "The bedroom light is on" or "The bedroom light is off"). Select the option that matches your query from the list that is presented to you. 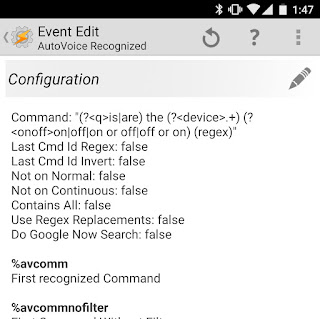 Note: AutoVoice will attempt convert your voice command into text and will display the list of options with the most likely option in the first position. What temperature is the AC set to? Did I leave the garage open? The same concept applies as was used in the instructions above. 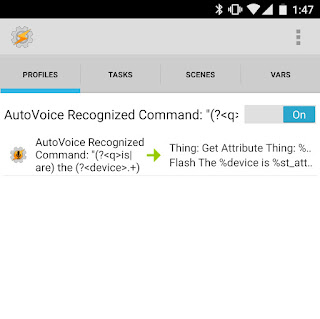 Simply swap out the AutoVoice filter for your updated query and replace the thing and attribute in the Thing: Get Attribute configuration. If you don't want to have the response spoken aloud, you might consider using the Alert > Notify or Alert > Flash action to have the result of the attribute query displayed on screen. Many devices have several different attributes that may be of interest to you, so play around and see what's out there. For example, in addition to pulling in the thermostatSetpoint, you might also be interested in pulling in the thermostatMode to see if it is set to heat or cool. You can also use the `Thing: Get Attribute` plugin with variables to get the current status of many of your things at once or to use variables to get the status of a desired device. To do this, tap the tag icon in the top action bar to switch to variable mode. Note: Make sure the "Use RegEx" box is checked in AutoVoice when using this approach -- this will convert the funky groups in parenthesis to variables that get captured. Important: When you are using `Thing: Get Attribute` in variable mode, the response changes from a set of single-value strings to a set of string arrays.